BATON ROUGE, LA -- The sixth live tiger to serve as Louisiana State University's mascot has been diagnosed with a rare and inoperable form of cancer. Veterinarians plan to treat Mike VI's spindle cell sarcoma with radiation therapy that could extend the 10-year-old tiger's life by one or two more years, Dr. David Baker of the LSU School of Veterinary Medicine said at a news conference Monday. Baker, Mike's veterinarian, said the tiger has a lemon-sized tumor in its skull but doesn't appear to be in pain and hasn't shown any changes in its behavior. "He's still tearing bushes up in his yard, playing with his ball," added Baker, who said the typical lifespan for a tiger in captivity is 14 to 18 years. The 420-pound tiger was 2 years old when it arrived at LSU, donated to the school by an Indiana animal sanctuary. 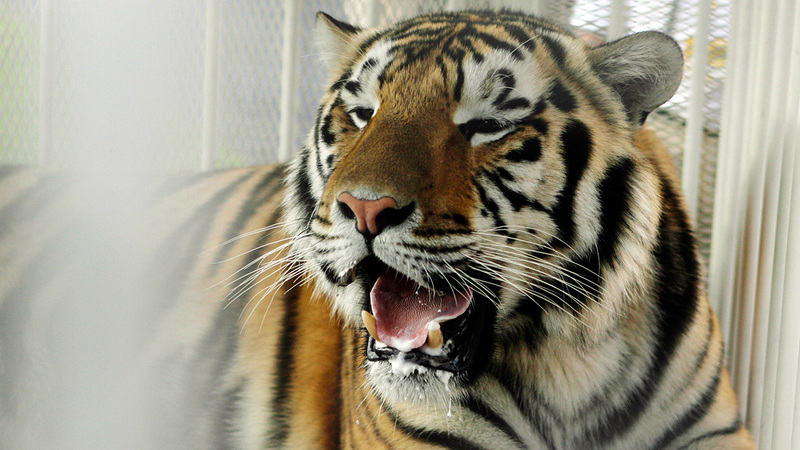 It lives in a 15,000-square-foot enclosure and yard next to Tiger Stadium. Fans can see Mike in its campus habitat, but the tiger appeared on the field for only one of LSU's football games last year - a season-opener with McNeese State that was canceled by stormy weather. Baker said the tiger's cancer had nothing to do with its reluctance to enter a trailer that takes it to the stadium. Baker said Mike probably developed the tumor a few months ago and likely would die within a few months if its cancer isn't treated. It will undergo a new form of radiation therapy that apparently has never been performed on a tiger before, he added. "This is not curative, but we do think this will extend Mike's life and allow him to live comfortably for some time," Baker said. LSU says Mike is one of only two live tiger college mascots in the U.S. and is the only one living on a college campus.